Festivus Ramen at Slurping Turtle - Solstice Communications, Inc.
Slurping Turtle, the original River North ramen shop and sushi restaurant, is excited to offer a unique bowl from now until December 24: Festivus Ramen. This delicious creation is a ramen bowl for the rest of us! 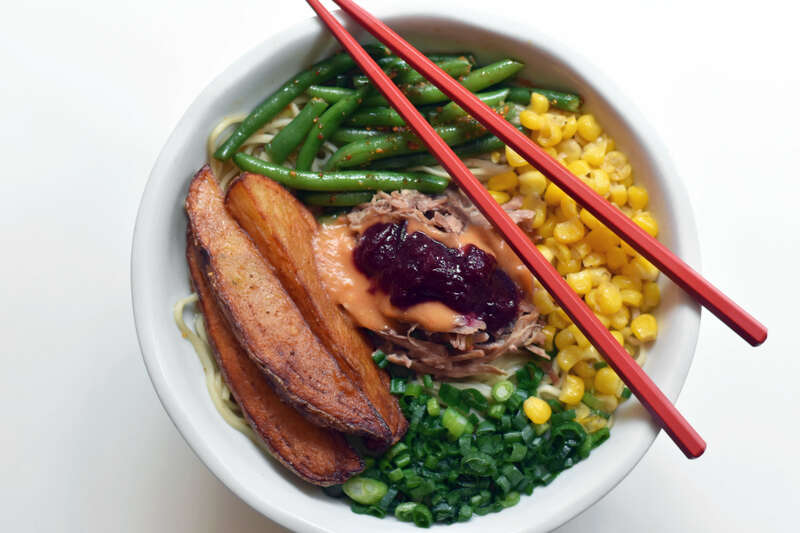 The delicious taste of the Holidays in ramen form, Slurping Turtle’s Festivus Ramen bowl features braised turkey, shio broth, buttered corn, togarashi green beans, potato wedges, scallions, spicy tonkotsu gravy with cranberry chutney. For just $15, there are no grievances to be aired about this yummy bowl! You probably need a drink to pair with your ramen, Feats of Strength ($9) is a delicious hot apple toddy with whiskey and apple cider, perfect for sipping around the Festivus Pole. Don’t wait around to take advantage of these Holiday flavors! Festivus Ramen and Feats of Strength are available from now until December 24.